A blueberry muffin recipe is one of my all-time faves. Juicy blueberries create purple pockets which burst into flavor when you bite into them. 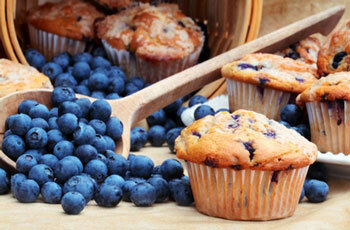 Sweet, but not too sweet, these blueberry muffins are kept healthy with the addition of buttermilk. Buttermilk not only keeps your baked goodies low in fat, but reacts with the raising agents to give your muffins a light, airy texture. Although it looks rich and creamy, buttermilk is actually very low in fat making it the ideal choice for low fat baking. Preheat the oven to 190°C / 375°F. Either grease a 12-hole muffin tin or use paper muffin cases. Carefully measure out the dry ingredients. 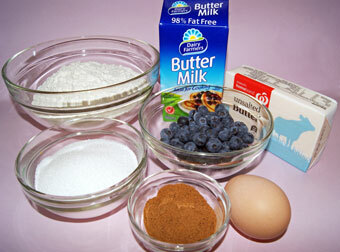 Sift the flour, baking powder, baking soda, salt and nutmeg into a large mixing bowl. Add the sugar. 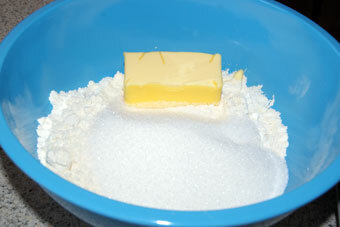 Cut the butter into the flour with a pastry blender or two knives until the mixture resembles coarse breadcrumbs. 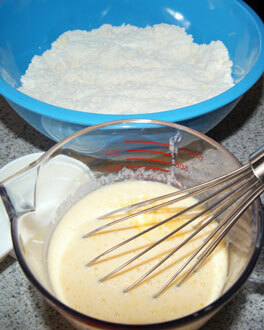 In a separate bowl, combine the buttermilk with the egg and whisk. Make a well in the center of the flour and add the egg mixture. Stir until almost combined. 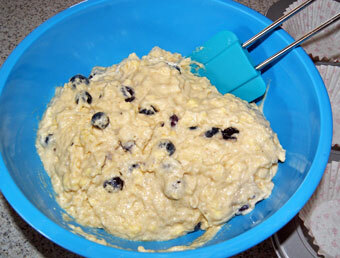 Then add the blueberries and gently fold through. Be very careful not to over mix. Line a muffin tin with paper cases and spoon the mixture evenly among the 12 muffin cases. Bake in the oven for about 25 minutes or until cooked. The muffins should spring back when touched. Remove the muffins when cool enough to handle, and place on a wire rack to cool. If using frozen blueberries, thaw, then drain away the liquid. Muffins are best eaten the day of baking. Enjoy them hot or cold. Store your leftovers in the freezer. These blueberry muffins freeze extremely well. 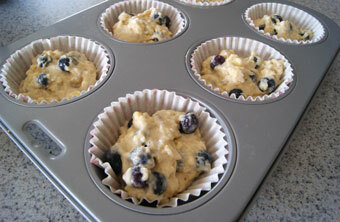 This blueberry muffin recipe can be used as the starting point for other fabulous muffins.